JD.com Inc. (formerly 360Buy), one of the largest online retailers in China, filed with SEC for IPO to raise up to $1.5 billion in the U.S.. The company started as an online retailer in 2004 and then introduced third-party retailers to its platform in October 2010. It’s business model, selling goods directly to users and take commissions from third-party retailers, is different from that of Alibaba’s Taobao & Tmall whose major revenue sources are search marketing and other advertising offerings. JD.com’s direct competitors in China include Dangdang.com, Amazon China and Yihaodian. The gross merchandise volume (GMV) on JD platform were RMB32.7 billion and RMB73.3 billion in 2011 and 2012, respectively. The GMV is RMB86.4 billion (US$14.1 billion) in the first nine months of 2013. Its operating income had been negative since 2009 till the third quarter of 2013. The company is well-known in China for its self-supported, effective delivery service. It has 82 warehouses in 34 Chinese cities, and 1,453 delivery stations and 209 pickup stations in 460 cities, with 18,005 delivery men, 8,283 warehouse staff and 4,842 customer service personnel as of December 31, 2013, according to the company. The delivery capability handled 211.7 million orders in the first nine months of 2013. 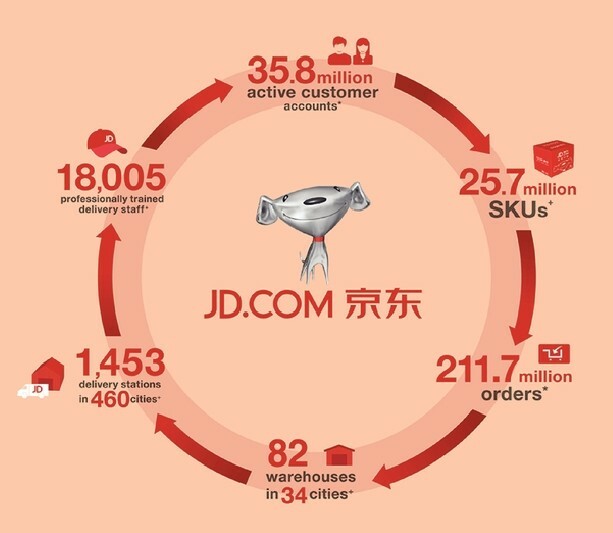 JD.com refers to itself as “the largest online direct sales company in China in terms of transaction volume”, “with a market share in China of 45% in the third quarter of 2013 “, citing iResearch reports. The company has received a total of $2.231 billion from four rounds of funding, according to the company and previous media reports.